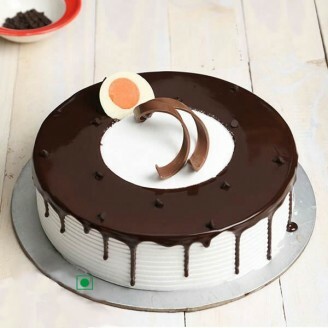 It is a delicious cake which delivers your love and wishes in a tasteful way. Grace the special occasion of your near and dear ones with this designer cake which is adorned beautifully. This enchanting cake is embellished in a classy manner and it is rich in taste. It is perfect cake if you are throwing a grand party. Order this cake and make your celebration zestier. The rich taste of vanilla and chocolate can make anyone’s taste buds go crazy. Spread the happiness in your loved one’s faces by sending this mouth-watering cake at their place. •	You can present this cake to your best friends on special occasions like farewell fresher’s party, birthday parties. •	Keep Out of reach of children of age less than 2. •	Delivered merchandise – cake may vary with the images shown above. •	Guarantees may not apply for timings during different celebrations and occasions such as Valentine’s Day, Friendship Day and Christmas etc.